Because of the known role of Snail transcriptional repressors in both neural crest development and tumor cell EMT, our lab is examining the function of Snail2 (formally called Slug) during neural crest EMT and emigration of cells from the dorsal neural tube. What genes does Snail2 target and repress during neural crest EMT? Are there distinct molecular similarities (or differences) between neural crest EMT and tumor cell EMT? One example of this is the direct transcriptional repression of the cell adhesion molecule cadherin6B (Cad6B) by Snail2 during neural crest EMT, mediated by the binding of Snail2 to E boxes (Snail2 binding sites) in the Cad6B regulatory region. Interestingly, the molecular mechanism of this regulation is analogous to that seen when Snail1 represses transcription of another cadherin, E-cadherin, during tumor cell EMT. Using molecular biology (QPCR), embryological (electroporation, in situ hybridization), and biochemical (chromatin immunoprecipitation - ChIP, gel shifts - EMSAs, luciferase assays) techniques, we are investigating the function and regulation of Cad6B, and other Snail2 target genes, in neural crest EMT. Our lab has been investigating roles for post-translational regulation of Cad6B during neural crest cell EMT. We were the first group to demonstrate evidence for cadherin proteolysis during an in vivo EMT event in the neural crest (highlighted in Mol Biol Cell). The Taneyhill Lab is continuing to investigate the importance of Cad6B proteolysis, as well as endocytosis, in generating migratory neural crest cells from immotile precursors. 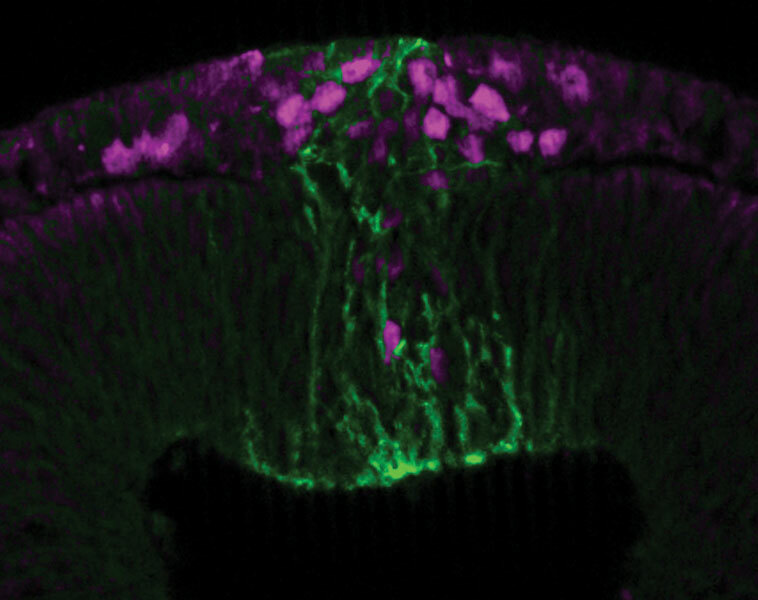 Premigratory neural crest cells in the dorsal neural tube of the chick hindbrain express Cadherin-6B (green) along their plasma membranes, with a high concentration apically (facing the neural tube lumen) and laterally at their edges. As neural crest cells undergo their epithelial-to-mesenchymal transition and begin to leave the neural tube, they express the transcription factor FoxD3 (purple cell nuclei) and gradually lose Cadherin-6B. Migratory neural crest cells will later give rise to a diverse array of derivatives in the chick head, including the craniofacial skeleton and sensory ganglia.